Many surgeries that required a hospital stay just a decade ago can now be done on an outpatient basis, allowing the patient to return home the same day to heal in the comfort and privacy of their own home. Advances, such as the use of laparoscopic surgical instruments, which require only a few tiny incisions, leave the patient with less pain and no incisions to heal. 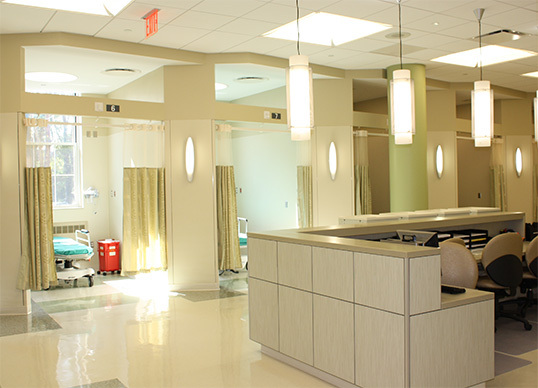 At SBH Health System outpatient surgeries are performed in our state-of-the-art Ambulatory Surgery Center located on the main floor of the hospital. The Center accommodates adult patients undergoing general, vascular, gynecological, orthopedic, dental and cosmetic surgery, as well as colonoscopies and endoscopies, among many other procedures. The patient-friendly Center has twelve patient rooms, each with a flat-screen TV, a beautiful waiting area for family members, and a spa-like décor that helps promote patient comfort and reduces anxiety prior to surgery. Nurses provide patients and their families with detailed patient education prior to discharge. Patients who may not be clinically ready for discharge will be admitted to the appropriate unit where they will receive the highest quality of care. Conveniently located, the Center has a patient drop-off and pick-up area and provides free parking on the day of the procedure.